Heat the olive oil in a large saute pan over medium heat and cook the garlic until it begins to soften. Add the red pepper flakes and cook for 1 minute. Stir in the anchovies and tomato paste and cook for 2 minutes. Stir in the green and black olives, capers, and tomatoes and cook for 2 to 3 minutes, until the tomatoes start to shrivel. Raise the heat to high and add the wine, allowing it to reduce for a couple of minutes. Stir in the parsley, lemon zest and juice. Season with salt and pepper and keep warm while the spaghetti cooks. Bring a large pot of water to a boil over high heat. Add the spaghetti and 1 tablespoon salt and cook until the spaghetti is al dente. Drain, reserving ¼ cup of the pasta water. Add the reserved water to the sauce and stir over low heat to blend. Add the spaghetti and toss well with the sauce. 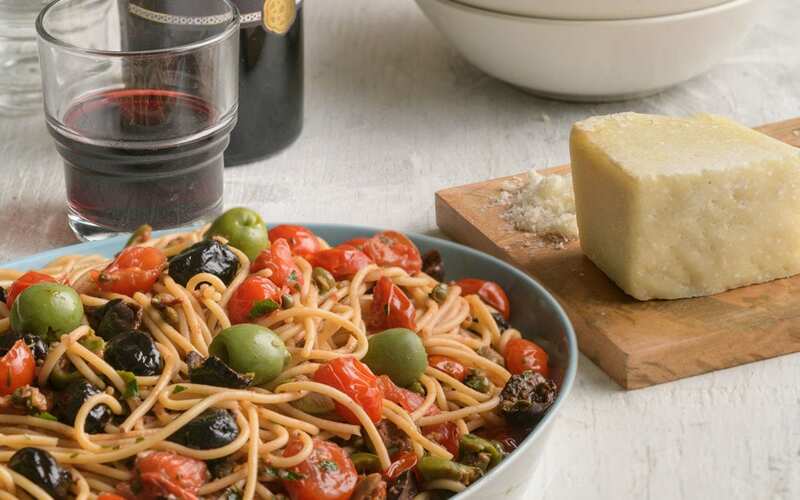 Garnish with whole olives and serve in bowls with Pecorino Romano cheese sprinkled on top.